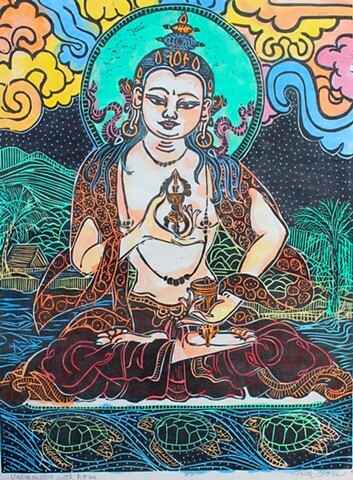 VajraSattva represents purity. He is invoked for purification and forgiveness for oneself and others. I try to paint a VajraSattva just before the New year so that I can start the year all fresh and clean. In this woodblock Vajrasattva is in a Hawaiian setting with honu, sea turtles drifting by. The background is Haulalai mountain on the big Island of Hawaii. I am interested in merging traditional Tibetan Buddhist images with Japanese style woodblock carving set in the landscapes of the places I live, Hawaii and Colorado. In this way I feel I am bringing the Buddhas to my homelands. They are the new immigrants. This is a large Moku Hanga print (traditional Japanese woodblock) hand carved and hand rubbed to print using watercolor inks. Moku Hanga is a labor-intensive old school printmaking practice. This particular painting is a fusion of wood block and hand painting with watercolors.